What happen with this situation with Magneto Will to Live? 2. Field Storm, reroll Magneto to a energy. For Wonder Man I would assume Magneto would go to the Used Pile since Magneto's ability triggers when he would normally go to the Used Pile. 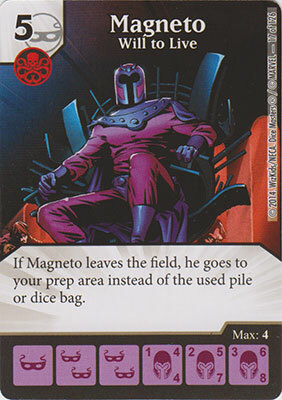 If he is KO'd he goes to the Prep area which doesn't trigger Magneto's ability so he would end up in the Used Pile. Now whether at THAT point it triggers Magneto's ability, I'm not sure. For Storm I would say he also go to the Used Pile because if he is rolled as an energy then he is no longer a character and his card text is void. Last edited by koolkat67; 11-04-2015 at 06:21 AM. I believe, Magneto is considered active until he actually makes it to the used or Prep, so even in both of these situations he should go to the Prep area. I could see maybe with Wonder Man since he is sending Magneto to the Used Pile. But isnt Storm sending Energy to the Used Pile and Magneto isnt actually leaving the field? Storm isn't sending energy to the used, she is rerolling a Magneto die as a mechanic of chance, to determine his fate. Only after her ability resolves would we check the state of Energy vs character. As a separate example, Moondragon has an ability that lets us reroll her, and return her to her previous face if we don't get what we want. By your logic, she could roll energy and become immediately inactive, and never be allowed to return to her character face. I am basically saying, durring the course of the resolution of an ability, from trigger, through reroll and into used, the character die retains its activeness and abilities. Only after an ability fully resolves do we stop to check a die's state, and alter the game. This is how Green Goliath can trigger from lethal damage, this is how when KOd effects trigger, and this is how I believe reroll effects track active characters. *groan* ok. so how is Wonder Man working? He sends Magneto to the Used Pile. Doesn't that resolve first? and by the time it does, Magneto is now not active to use his ability. Magneto would be going to the KO, but is told to go to used, but then triggers his ability that says he goes to Prep. It could be argued that Magneto doesn't trigger, but I haven't seen any precedence either way. 1.) Neither ability has a can't or cannot keyword so no immediate overrule. 2.) Wonderman KOs Magento and sends him to the used pile, Wonderman's ability is completed. 3.) Magneto's ability is than checked, did he leave the field? Yes, his ability triggers and he is sent to the prep. 1.) No can't or cannots. 2.) Storm is fielded and rerolls magneto as a valid target. 3.) Character face, nothing happens. Energy Face he goes to used. 4.) Energy face he goes to used. 5.) Storm's ability is completed, now magento's is checked. 6.) Leaving the field, gets redirected to the prep. Both examples have no real contradictions as each characters abilities fulfill all requirements. Regardless of who is the active player, the ability can be resolved in the beneficial order for the player with Magento. Another keyword is on Magento's card, "Instead," this keyword causes a redirect and an interrupt to his normal traveling. My conclusion, without prismatic spray, Magneto is always going to prep. Great explanation! The only issue I have is these Rules of Thumb contradicting each other. I hear many times "a character is only a character on the character side of the dice". So for Storm vs Magneto I followed that rule and thought HE is not actually leaving the field anymore cuz its now Energy if rolled that way. But now Magneto can be rolled to an Energy and still maintain his Active ability. I'm sure you guys are right but it's just tricky figuring out which rule applies when. I think using the ruling on Maria Hill, it's fairly clear Magneto's ability would still be active. When this character and a Shield character go to your Used Pile at the same time, put both into your Prep Area instead. When does this trigger? What if you buy her and another Shield character at the same time- would they both go to prep? Thank you. Also another way to look at it is similar to Moon Dragon or the Giant Man that can be rerolled and switched back to their original face. These characters can potentially be rerolled into energy faces, but have the extra benefit of reverting back to character faces as their ability isn't done resolving. Magneto's is the same in concept only his is an interrupt. So long as he WAS active prior to being rerolled into a energy face. Im not sure how Maria Hill's card helps here. Neither in the Trigger or Not Trigger explanation does it give a scenario of a character die turning into Energy in the field. yeah maybe in the part you set as Bold but thats sending them BOTH as in characters not just dice. I'm sure I can find a quote by them or the rulebook without too much trouble saying a character is only a character on its character side without it saying EXCEPT while its Active. Moon Dragon and Giant Man specifically say you can change them back to Character sides so that doesn't seem like something to base Magneto on. I'm totally not disagreeing with you guys. I'm just trying to understand when you to use which rule of thumb. Wind Rider specifically rolls a character to an energy face, and then sends them to the used. That's exactly the situation you're discussing with Magneto. Maria Hill's ability requires her to be active to trigger, and this ruling says that she still counts as active while being moved to the used by Storm. This ruling clearly states that Maria and another shield character are still considered active when rolled to energy faces by Storm. We can extrapolate that to also mean that Magneto would still be considered active while being rolled by this single target version of Storm. As for the Moondragon and Giant Man examples are here to show that when a die is rolled to an energy face, their ability is still considered active, until they are moved to the reserve pool, after the current effect ends. Magneto would still be considered active until the effect that rolls him fully resolves, meaning he would have the opportunity to trigger and redirect his movement. I missed the Wind Rider part in the ruling the first time. THANKS!